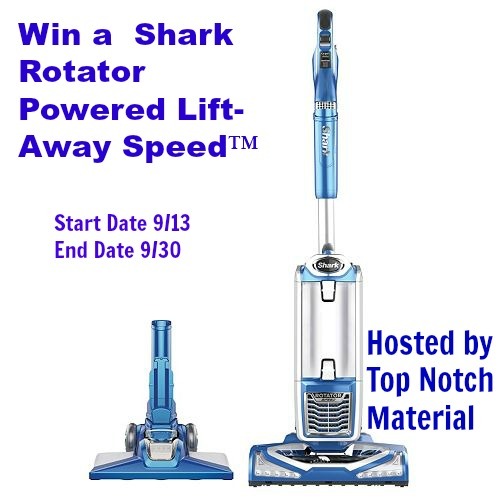 Top Notch Material: Shark Rotator Powered Lift-Away Speed™ GIVEAWAY! Shark Rotator Powered Lift-Away Speed™ GIVEAWAY! Top Notch Material has teamed up with Shark to offer this amazingly versatile and affordable vacuum! You can read more about the Shark Rotator Powered Lift-Away Speed™ here. Winner has 48 hours to Reply to winner email before another winner is selected. Disclosure: The above item was received by Paige at Top Notch Material in order to facilitate review. Top Notch Material or any participating bloggers are not responsible for prize fulfillment; sponsor will be responsible for prize fulfillment. This event is in no way associated with, sponsored, administered, or endorsed by Facebook, Twitter, Google, Pinterest or any other social media network. If you have any questions, please contact me at nursemommypaige at yahoo dot com. The disclosure is done in accordance with the Federal Trade Commission 10 CFR, Part 255 Guides Concerning the use of Endorsements and Testimonials in Advertising. I like the long cord & the 7 year warranty. I like the lift away mode and how easily versitile it is. I love that it is super quiet. That's a big factor in the next vacuum I buy. My toddler hates our vacuum because it's so loud! This is really nice. I like the lift away mode. I like that it really cleans! My vacuum (another brand)is getting old and not working so well anymore. Thank you for the chance to win! I like the 7 year warranty! My favorite feature of this is the lift away features. This would make the stairs so much easier. We have 2 staircases and I absolutely dread having to vacume them with my heavy vac. I really like the lift-away mode and fingertip controls. I love the lift away. I can sweep under the bed and on the stairs. I really like the lift away feature. It would make cleaning easier. I love the accessories, you can find the piece to clean every nook and cranny! I like the lift away mode and the 7 year warranty! I love the long cord! I hate having to unplug and replug when im on a roll! I like the two different vacuum heads that you can switch out for hard surfaces or carpets. What's not to love!!?? Outside of the lift away feature and all of the attachments, I would say the fact that you say it's amazingly quiet for such a big vacuum. A single thin wall separates me and my neighbor. She's the neighbor who is amazing to live beside except for the fact that she stays out really late, especially on the weekend and since I do my housework early on Saturday morning, I manage everything but my vacuuming because my current vacuum is so loud and I don't want to disturb her sleep. I usually save my vacuuming till late in the day or end up doing it mid-week when she isn't home. Having a vacuum that is quiet would definitely be a plus for me! Two things that are required for me..the suction..and you say it's great. And, I love the lift away feature...so convenient! I've heard great things about shark..and, we could use this..crossing fingers..although I do know it's a long shot! So many awesome features. One of my favs is the lift away. I like that it's so lightweight and also the long cord. I like that is is lightweight and quiet. I love that it is lightweight. I have 10 stairs to carny it up! I like the long cord, it is drives me crazy when I have to un plug my vacuum and re-plug just to finish a room because my cord won't reach. I like the two interchangeable heads that you can switch out for use on hard surfaces or carpets. I do like that it can go from hardwood to carpet, & it can change it's suction amount. Those are big bonuses. I like the Dynamic Power Steering feature. I love that this has a lift away mode and is so lightweight, sounds really convenient.